A cashier refused to sell a lottery ticket to a 37-year-old man because it might encourage his eight-year-old son, who was with him to gamble. Trevor Haimes, 37, of Trowbridge, a town of Wiltshire, England, had been shopping at an Asda store. 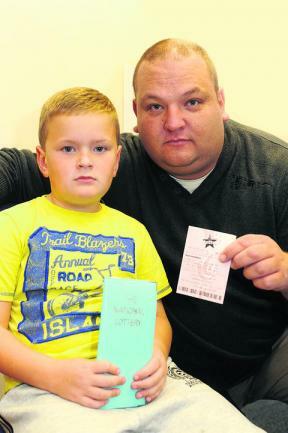 He went to a kiosk to buy a ‘lucky dip’ lottery ticket with his son Zak. Zak asked for tickets and the cashier refused to sell it to him on the grounds that he could give the tickets to a minor. Haimes then asked his son to stand at the entrance of the store, just outside the building and then he again asked for tickets but was still refused. “Initially, I thought she was joking but when she refused to sell me a lottery after asking a third time without my son present, I knew that she was serious. The cashier said that I was teaching my son to gamble. After refusing to sell me the lottery ticket, the cashier sarcastically said, “Have a nice day, sir, thank you”, I thought, I’m not having this and asked for a refund on my shopping,“ Haimes said. Upset over the incident, Haimes returned his groceries which came to about $60. “We went to another branch of the Asda store in Trowbridge and a petrol station. Zak asked for the tickets and we got served each time,” Haimes said. Haimes complained to the Asda owners but they replied that they fully backed their staff. “We’re are committed to following legislation around National Lottery sales,” an ASDA spokesman said.